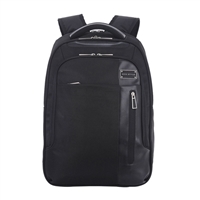 Tech Exec's sleek and sophisticated checkpoint friendly backpack is feature rich and will accommodate laptops up to 15.6 along with a dedicated tablet/iPad compartment. No need to remove your laptop as checkpoint friendly feature meets TSA requirements and allows for a quick & easy x-ray scan. 13.5" x 18.5" x 7"